We went to visit a friend in her newly renovated camp in Millinocket Maine. Kind of sounds like a theme with us this years. It is around a 6 hour drive north; I did keep my eye out looking for a sight of a moose; mostly so we didn’t hit one as there were many signs on the way that said to watch out for them. But I really wanted to see one; I did have to laugh a couple of times at myself, did I really think I would be able to see a moose while driving 75+ miles an hour on the highway? I did not – not any all weekend! We had a wonderful meal Friday night of Roast Beef, Gravy, Baked Potato, Butternut Squash, Green Beans and Yorkshire pudding; all were excellent! We stayed up pretty late talking, drinking and laughing; when I woke up, way too early around 6am – I know I have issues! I was the only one that got to see the sunrise and it was pretty AMAZING! 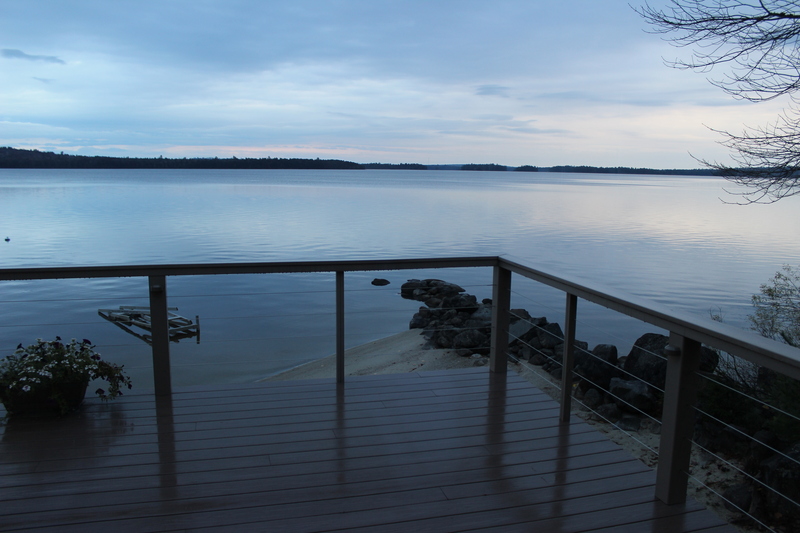 The house was extremely quiet, the view unbelievable and the water’s edge was so incredibly close. While I was sitting there I had a kind of epiphany. I have had a pretty great year so far!!! I am very blessed and extremely grateful for my family and friends. I am very proud of my kids; I am thrilled they are happy and healthy and that we have a very close relationship. I am grateful for the friends I have, the ones that live close by and I see often and the ones that are further away and that I was able to spend more time with them this year. I started a cooking class and a blog that are both getting a lot of positive attention. People seem really interested in knowing more about both, even all the way up in Maine. We had a Halloween party Saturday night that we all helped get ready for. We had Swedish Meatballs, Corn Chowder and a yummy cake to make. I was in charge of the Corn Chowder. I will admit that I have only made this once maybe twice ever. My family doesn’t like it so I don’t have a “set” recipe in my head. 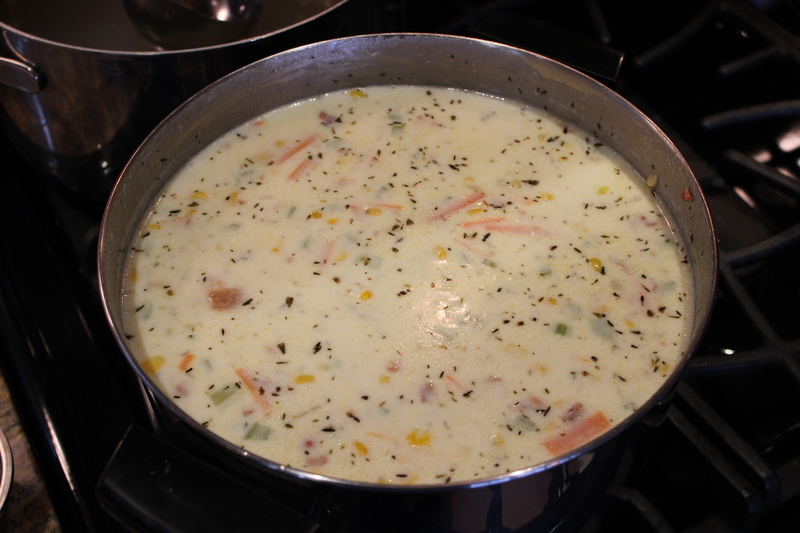 I do however enjoy making soups/chowders and believe it or not my class on Thursday was a soup/chowder class. It must have been a sign. I do tend to use things up in the fridge in my soups. So I started by chopping up onions, celery and julienned some carrots. Sautéed them in some olive oil and a little butter; Thyme is one of my favorite herb for chowders, so that was my base and it help build a yummy soup from there. Everyone, except Rich, loved it. Told you he doesn’t like it! In a large stockpot over medium high heat, cook the bacon and olive oil until the bacon is crisp. Remove the bacon and set aside. Reduce the heat to medium, add the onions, carrot and celery and butter to the fat, and cook for about 10 minutes, until the onions are translucent. Stir in the flour, salt and pepper and thyme, cook for about 3 minutes. Add the chicken stock and the potatoes bring to a boil, and simmer uncovered for 15 minutes, until the potatoes are tender. Add the corn and the heavy cream. Season to taste, serve hot and garnish with crumbled bacon. It’s finally getting to feel like fall in Japan; so excited to start making soups and chowders and stews! I want corn chowder, wish the bacon was better here. I made BBQ pulled pork in my rice cooker though; next up is beef stew! It was 28 in ME when I woke up Saturday morning! You don’t HAVE to use bacon, it would make it healthier if you didn’t but I hear ya it does add a little love to the soup! I made the best crockpot beef stew a couple of weeks ago. It was crazy good! I hope yours turns out just as good if not better!